The Golf front mount reacts a large proportion of the accelaration and overrun torque and has to carry a proportion of the powertrain weight. The original VW mount was always going to be a compromise! 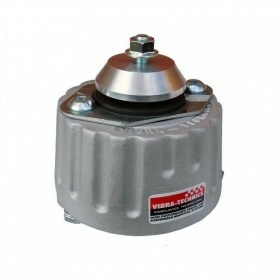 This Vibra-Technics design is a direct replacement for the original but allows only a fraction of the engine movement. Therefore there is none of the engine inertia forces throwing the engine back and forwards under throttle on and off conditions. The car has a much 'Tighter' feel and exhaust manifolds are not subject to high bending stress. In addition the level of noise and vibration transmitted to the cabin is not greatly increased.